Hygeia, hygea, hygeia reproductions, hygeia statues, hygia statues, Athena, athena statues, goddess athena, athena sculptures, greek art, greek reproductions, greek gifts, greek, museum reproductions, greek statues, statues,greek sculptures. National Archaeological Museum, Athens. 360 B.C. 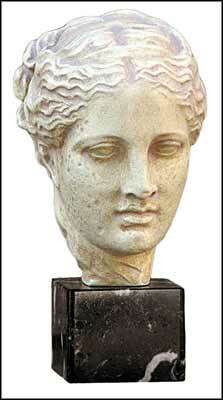 She was the daughter of Asclepios, the God of medicine. She was worshipped as the Goddess of Health. Her worship probably started in the 4th century at Epidauros in association with the great temple to Asclepios that was bringing thousands of infirm people to that city for medical assistance. The beautiful marble head from which this reproduction was made has a divine sweetness and is thought to have been the work of Skopas, one of the three greatest sculptors of the 4th century B.C. It probably belonged to a statue which stood in the temple of Athena Alea at Tegea in the Peleponnese.